The history of Ghana goes far back into the 13th century. The Republic of Ghana was formerly known as the Gold Coast until midnight march 6th 1957, when it was liberated from the hands of the British. The name Ghana was derived from the medieval Mali empire which was also known as the Ghana Empire of West Africa. Ghana was the title of the Kings who ruled the kingdom which was then controlled by Sundiata Keita, founder of the Mali Empire in 1240 AD. It is believed that the ancient people migrated from the Ghana Empire, which is several hundred miles to the northwest of the Country Ghana. This is the southern part of today Mauritania and the western side of Mali. The history of Ghana has gone through a series of metamorphosis with lot of theories from academics and ancient tales. Many books about the history of Ghana have minimal conflicting issues pertaining to the origin of Ghanaians. Bottom line, they all arrive at the same point making the history of Ghana very reliable when it comes to the people and places. The Portuguese were the first white merchants to arrive in Gold Coast in the 15th century to trade mainly in Gold, Diamonds, Ivory, just to name a few and most importantly Slaves. In 1842, a year after their arrival, built the first castle in Gold Coast, called the Elmina Castle (Sao Jorge da Mina) and a second one also known as Fort st. Anthony at Axim, a small fishing town in the Western Region. The Dutch joined them in 1598 for the same results or rewards and more. They also built forts at Komenda and Kormantsi all in the central region. By 1637, the Dutch had enough power to stop the Portuguese from monopolizing business by overthrowing them and taking possession of their two Castles. Other Europeans who joined this "wheels of fortune" in the Gold Coast were the British, Danes and the Swedes. 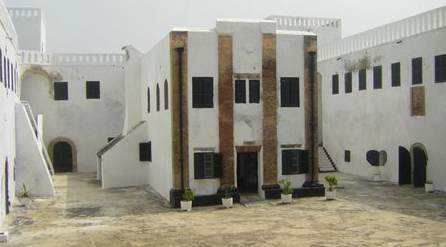 The Danes built one of the most important Castles, the Osu Christiansborg Castle in Accra in 1661, which is now the "White House" of the President of Ghana. 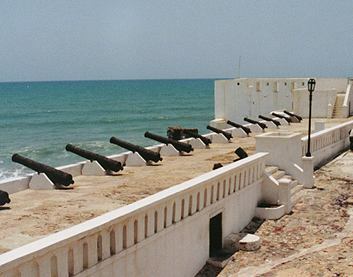 The Swedes also built the Cape Coast Castle which was used as a Slave depot to "store" slaves awaiting to be loaded into the next available ship to Europe. This castle was taken over by the British in 1665. The competition for Gold, ivory and slaves was so intense that, the Gold Coast had the highest concentration of European military warfare outside Europe. Due to this fact, out of the 110 forts and castles built in West Africa, 100 them can be found on the coastal areas of Ghana. The British took over the Southern part when the Dutch withdrew in 1874. The Ashanti Empire, was the strongest at that time controlling the Northern sector of the country. They grew more powerful as they progress and conquer other tribes on their way south. This became a big concern for the British because they feared the Ashantis would control and monopolize trade if they conquer the southern part, especially the Fantis. In 1806 the Ashantis attacked the Fantis who were backed by the British and defeated them. This was the beginning of a lengthy series of wars to come, as the Ashanti Kingdom progresses toward the coastal areas, all in the interest of minimizing the power of the British. In 1821, the British took control of the coastal parts of Gold Coast. This happened when the Fanti chiefs re payed their "debts" for British alliance by signing a legal document which eventually paved the way to Colonial rule by the British. They named this area, Cape Coast which was formerly known as Cado Corso and made it the Capital of Gold Coast until 1877, when it was changed to Accra. The British built some Churches like the Methodist and they also built the first English school- Wesley Boys High School in 1876, which is now known as Mfantsipim. By 1902 the British had gained full power of Gold Coast, by defeating the Ashantis with the help of the Fantis, the Gas and all enemies of the Ashanti Empire. The British ruled until March 6th, 1957 when the Convention Peoples Party(CPP), leader Dr. Kwame Nkrumah became the first Ghanaian Prime Minister. This was the day, Ghana became the first Country in Africa, to be Liberated from the Whites. Other African nations followed our steps after that. This date is a special day on every Ghanaian's calender. It is an important day in the history of Ghana and Africa as a whole. 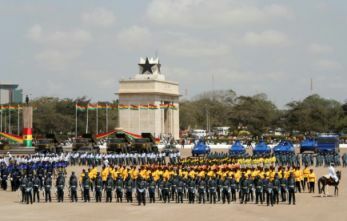 A special marching parade is organized annually, to remember all those who fought for Ghana's freedom. On July 1 1960, Ghana changed from the Parliamentary "Prime Minister" system to a Republican form of constitution. He then became the first President of Ghana. Shortly after that, Nkrumah's regime was overthrown and the party and its members dissolved in 1966. He went to exile and became a Co-President in Guinea and died after an illness in Budapest, Romania. His remains are kept in the Kwame Nkrumah Mausoleum. A series of coups occurred after that, with occasional constitutional rule until Jan 7th 1993, when Ghana became a forth republic. Jerry John Rawlings become the President after ruling under the "umbrellas" of military power for about 12years. He won a second term in office until 2000. His party, National Democratic Congress (NDC) lost to their arch rivals, National Patriotic Party (NPP) led by the Current President, John Agyekum Kuffour. His second term of office ended in December 2008. The current President of Ghana is Prof. Atta Mills who's party(N.D.C) won the Dec. 2008 elections. He reigns for the next four years. Prof. John Evans Atta-Mills led the National Democratic Congress to victory in the 2008 polls. Sadly, he died while in office on July 24, 2012, barely five months to the 2012 polls in December. His vice, John Dramani Mahama was sworn-in as president per constitutional arrangements. He went on to win the closely contested 2012 polls. Then opposition leader, Nana Addo Dankwa Akufo-Addo and the NPP contested the results of the polls in the Supreme Court but the Supreme Court ruling went in favor of the legitimacy of John Dramani Mahama's victory. Come December 2016, the New Patriotic Party won majority in Ghana's legislature and Nana Addo Dankwah Akufo-Addo went on to win the presidnetial polls with close to a million votes separatting him and NDC's John Mahama. Nana Addo Dankwah Akufo-Addo was sworn in as Ghana's fifth president in the fourth republic on January 7th, 2017. He is serving a four-year term.